Parity in the league went out the window as soon as the Big 3 got together in Boston. Well, it was more the culmination of a process begun years earlier. Ageing veterans getting together for one last shot at a title? Sounds very familiar. Rodman, Jordan and Pippen teaming up for a 3-peat, Shaq and Kobe, and most recently the host of veterans who won that 2006 title with just a shot in the arm from D-Wade. And then, of course, Boston. The days of young teams ousting the established champions are gone - though the Thunder are looking threatening - with marquee players increasingly abandoning their teams and joining forces to beat age. Usually this only happens when the players are desperate enough or free-agent enough to sacrifice their own game. A team's fortunes seem to shift ever quicker in the modern game, although perennial losers like the T-Wolves will likely stay that way barring a miracle, and the chances of a legitimate dynasty where a team not only wins multiple championships but dominates the regular season also seem slim, because veterans don't need the regular season, and they seem to be the only ones winning championships. However, there are a few teams floating around which have a good core group, and just need a little bit more to be contenders. So here are a few of my trades and free agent signings which I think will be best for all involved and create a more level playing field in an ideal world in an effort to up the number of teams able to compete with the likes of the Lakers. Miami: Wade has needed a dominant inside scorer since he lost Shaq and the rest of the old-timers in 06. Give him Stoudemire and you've got a pretty sweet deal right there. Stoudamire can play up-tempo which suits Wade and is used to playing second fiddle so won't need the ball in his hands all the time. Wade doesn't need a playmaker, as he showed himself capable of getting his teammates involved, he just needs better players around him. Enter Devin Harris at the point and you have a pretty intimidating offensive team. Goran Dragic would be tailor made for this situation also, as he gets tunnel vision and just attacks, with Wade limiting his touches he could be a solid contributor. Chicago: Rose, Noah and Deng each bring something a bit different to the team; leadership, hustle, and a decent jump shot. However, they need another shooter and a more offensively talented big man. Enter Joe Johnson and Chris Bosh. These 5 as starters is a little bit scary. You could swap Bosh for any of the free agent PFs really though. David Lee could work. Clippers: If it weren't the Clippers I'd be more hopeful here, but God knows they aren't dependable. However, if everyone stays healthy they've got a pretty good starting 5 with just the one whole at SF. This could be filled in the draft, but why not give Tracy McGrady a shot? Sure, he is primarily a 2-guard but he doesn't lack the height and has expressed a willingness to take a back-seat role. Davis, Gordon, McGrady, Griffin and Kaman. Sounds like a plan to me. Nets: The Nets have a promising Centre in Lopez, a promising PF in either Yi or Favors or Cousins (take your pick), and a promising SG in Lee. However, Devin Harris is not the leader of the future. But while we are looking at young players, bring in a young PG while you're at it in Collison from the Hornets. He ran the team admirably in CP3s absence and showed remarkable poise when playing from behind (something the Nets will be doing often I think). Like the Thunder, if this group is allowed to grow together they could be a contender in the 5 years the Russian is promising. New Orleans: The best PG in the game, a good scorer in Thornton, solid bigs in Emeka and West and the hole remains at SF. Good fit here would be someone who can shoot the long ball (a weakness for the Hornets) like McGrady. I know I already gave him to the Clippers, but if most of these situations are a fantasy anyway so why not have fun with it. Atlanta: The reason the Hawks lost was because their C is a PF. Move J-Smoove to the SF position where he belongs and let Horford be that energetic PF. All Atlanta needs now is a big, defensively minded C to stop Dwight Howard destroying them and they could be ready to take that last step. Why not bring in Brendan Haywood. Everyone loves a 7-footer! Cleveland: I've said this before, but Beasley, Hickson and Varejao could be an intimidating set of bigs. All they need is the right guards. Parker could still be useful, but a point guard is what they lack. Maybe Collison doesn't work out at the Nets and comes to Cleveland. I have faith in his ability to run a proper offense - which the Cavs might actually have without Mike Brown. I know there are teams who could use David Lee, but all this exam study is screwing with my brain and it's late. These are just a few teams who could benefit from the free agent class of '10. Also, I'm aware that I didn't mention Lames, but quite honestly I can't see his sheer ball dominance benefiting many of the teams who just need a bit of tweaking. Not really sure what to do with Boozer, but he could fit in with Wade in Miami or in Chicago with Rose also. Stoudemire is the most valuable free agent in terms of what he brings to an established team; he can move without the ball and play the pick and roll well. He has also shown his ability to explode when required and knows how to be a superstar role-player. If he ends up in either Miami or Chicago, things could get very interesting out East. Bosh would be a close second only because he is used to being top dog in Toronto and I'm not sure how he would handle the transition to second fiddle in another team. This whole free agency bonanza is giving me a headache. I can't wait to see it play out, but I hope a few of these situations come about. Winning doesn't mean good basketball. There are a few teams in the NBA who play such fundamentally different basketball that I can't stand to watch them. They have made an executive decision to do one thing, and stick to it. Take the Golden State Warriors, they have decided to go all-out offense to try and take other teams out of their rhythm and sure, sometimes it works. But winning a game or two doesn't make it good basketball. In the case of the GSW it is obvious. But there are other teams out there who I find frustrating to watch, and even moreso when they beat a fundamentally sound team. So here are my thoughts on a few of the most one-dimensional and irritating teams in basketball. Take Cleveland. Yes, they have had the best regular season record for two straight years, but they are so LeBron-centric that even if he stays and gets superstar help their playing style won't grant them a championship. While James' numbers are ridiculous, and he had a season statistically similar to Jordan circa 1987, he needs to learn like Jordan did to take a step back. Unless he is officially playing the PG position, there is no way he should be running every offense, especially when that usually just entails LeBron winding down the clock and then gunning for the rim. The other Cleveland players often only score when the other team gets so frustrated with 'Bron they forget the other players are there and they sneak in for a layup or three pointer. A system where the job of 4/5 players is to be as inconspicuous as possible doesn't sound like a championship team. A possible solution would be for LeBron to act as a diversion on a few more plays and create for his teammates without actually touching the ball. He would have more energy for defense and he could take over during the fourth quarter. But playing like Kobe in the 4th for 40+ minutes for 82 games is no way to build a champion, even if it does get you a pretty good regular season record. Put simply, 'Bron needs to learn trust and just do less, not more. Now that Mike Brown has gone he might get a coach who makes that happen. Now I'm looking at you Orlando. Considered by many (myself included) the best team in basketball towards the end of the regular season, they were a different team from last year. That difference was Vince Carter. Sure, he can shoot the three ball, but all of a sudden they have a player who can take it to the rim off the dribble and their attack becomes so much more balanced. With shooters like Jameer Nelson (who is playing out of his mind at the moment), JJ Redick and Rashard Lewis on the perimeter and Superman posting up and getting oops, they had a potent offense and a solid defense. In the first two rounds of the playoffs they swept two teams and looked ready to make another trip to the finals. But wait, they found a team who was better at the half court game, and was playing championship calibre defense. The Magic dropped 3 games to Boston and all of a sudden the pressure was off. People had written them off as a threat in the series and instead of being the favourite, they were back in the role that got them to the Finals - the underdog. As soon as they went down 3-0 a change came over them, and all of a sudden they were once again prepared to live and die by the three. With nobody expecting them to win the series, they took treys nearly every time they went down the floor, and Vinsanity found his services as a dribble penetration player were no longer required. Enter JJ Redick, the shooting backup who makes a living on free throws and three point shots. With that reckless commitment to 3 point shooting and with Dwight picking up his game offensively the Celtics were forced into double-teaming and all of a sudden the skies above opened, and 3s came pouring in. And all of a sudden, they were only down 3-2 in the series and were in a position to make history. It still isn't good basketball. I call them one-dimensional because Dwight had a big game earlier in the series and it didn't lead to a Magic victory; the three pointer is their go-to strategy. I think the reason the Celtics aren't defending the 3-ball so well is because it hasn't quite sunk in just how committed the Magic were to pulling the trigger on the long ball as many times as they could. In the first two games they had 22 and 18 3-point attempts. In the two the Magic won they had 25 and 28. If the Celtics D had given them more, they likely would have taken more without hesitation. But it is easy to make 3s when it seemingly doesn't matter, it will be altogether different when the pressure is back on the Magic. This is what I can't wait to see. Game 6 will be Boston's best chance to put away the series, but not because it is a home game, but because all of a sudden the Magic have the momentum and the expectations have come rushing back in. I don't think Orlando has the mental toughness to shoot the ball well when it counts. So let the Magic shoot their 3s, let them complain to the refs every time a call doesn't go their way but now they have something to lose, we'll see whether a one-dimensional attack beats good solid basketball. I already mentioned Golden State, and quite frankly, they don't deserve any more space on this site given their team philosophy. I'd like to add that any team which tries to win solely through the transition game isn't winning any championships either. So let's hope the Magic don't win a Finals series this way, because it could have an alarming ripple effect for the League. We don't want to see 3 pointers unless they are game winning buzzer beaters, or it is Ray Allen nailing one the moment he is given even the slightest amount of space. Boston needs to win so we have more slashing, dunking, post moves and contested rebounds that make the game we love so great. It seems that once a generation the pivotal position on a basketball team shifts. In the league's early days big men like George Mikan, Bill Russell, Wilt Chamberlain and Kareem Abdul-Jabbar were dominant players of their generation. There simply weren't enough big men on opposite teams to stop them. Then came the 80s, when Magic Johnson and Isaiah Thomas made the point guard position popular again and led their teams to championships. Admittedly, Bird dominated at small forward, but he played more of a "point forward" as we would call it these days. Then all of a sudden, the man Larry Bird called "God playing basketball" entered the L and everything changed. The shooting guard went from a fairly insignificant part of the team to the glamour position in the NBA. Jordan revolutionised the position and all of a sudden, players were being drafted to counter the threat posed by Jordan and a generation of brilliant 2-guards followed. Clyde Drexler, Reggie Miller, Joe Dumars, Kobe Bryant, Vince Carter to name just a few. The lines between generations clearly aren't clear cut and some of the remnants of the 2-guard generation still play. But a change has been coming, and these days, the small forward position is gaining increasing prominence, if LBJ was two inches shorter things might be different, but some of the best players in the league are in this position. James currently sits at the top of the small forward pool but he is joined by Kevin Durant, Paul Pierce, and Carmelo Anthony as some of the best players in the League. Take a look at this year's draft prospects, a four-year college player with only one remarkable season under his belt in small forward Wesley Johnson is considered a top-five pick, whereas the best shooting guard in the draft Xavier Henry, who has shown promise in his only year at Kansas has dropped to 10. This year's ROY Tyreke Evans is the perfect height for a shooting guard at 6'6" but instead he's playing PG. With his driving ability, he should be moved to the 2-guard while a less talented offensive player creates for others. But go back even further and look at OJ Mayo. The kid is good. And in the 90s he would have been handed the keys to the team, but instead is playing second fiddle to small forward Rudy Gay and settling for being a low-volume jump shooter. While the Grizzlies have had a better season, I keep waiting for Mayo to step up and prove why he has been compared to current SG king Kobe Bryant. Maybe when the Grizzlies lose Gay to free agency Mayo can step up and be the star he was made out to be. However, Kobe, arguably the second greatest SG of all time is still around, and playing close to his peak - if anything he has gotten even more clutch. He isn't going to let the 2-guard generation end without a fight, and while the "King" (of what exactly?) has yet to win a title Kobe has those four delicious cookies and is in contention for the fifth (though I think the Celtics will prove too much for him). The battle between KB24 and LeBron can be seen as a generational battle, just like that fought by Jordan and Magic Johnson; only when they meet in the Finals will the small forward position be proven the one to win championships. As it stands, Kobe is clearly winning, and with that killer mentality, it looks to stay that way for some time to come. Team success is what matters, and clearly, the best SG is doing better than the best SF - regular season aside that is. Just a heads up that now I've got a bit of a backlog for new readers the rate of posting will likely drop. Eventually I'll be updating roughly 3 times a week and probably closer to once a week during the offseason. So that's me out for the time being. Why Stephen Curry could have saved the Knicks. Now, I'm not saying this hometown hero could have carried the franchise on his back, but the Knicks fans had reason to be upset when he was selected one shy of their number 7 pick by Golden State Warriors. Curry coming second in ROY voting and averaging 17.5ppg, 5.9apg and 4.5rpg while their actual draftee was traded after clashing with Coach Mike D'Antoni didn't help matters either. Some of you might say his numbers were inflated by the Golden State scoring assault, and they'd be right. But this kid is more than numbers. He has one of the quickest releases in the game and shot an impressive 46% from the field for a guy who mainly takes jumpshots. This young talented scoring machine would also have been the perfect point guard to attract LeBron James to the Big Apple. A quick shooting guard who can create his own shot and make plays for others is great, but one who has shown he can thrive alongside a ball dominant player in Monta Ellis is even better. Think Mo Williams, but you know, not a chump who disappears every second game. In three years at Davidson, Curry scored double digits in every game bar two. Playing three seasons is a rarity for a player of his talent, and certainly for point guards in the current trends. But that was just seasoning, letting the already good skills become great. Unlike fellow college great JJ Redick, Curry took to the pro-league like a duck to water and his performance was the bright spot in an otherwise dismal season for Golden State - how they remain a franchise with such a callous attitude towards winning is extraordinary. He would have made a brilliant Pippen to LeBron's Jordan; a younger player who would thrive on a team where every defender has one eye on one of the best players in the league (yeah you heard me, Kobe still has it, sorry guys). More than that, he would have worked well with Gallinari, another talented shooter on a team who needs a ball-dominant player to complement to sterling effort of underrated David Lee. But perhaps his greatest appeal is the excitement he brings. Curry's enormous 36, 10 and 13 triple-double on February the 11th sent shockwaves around the league and brought an element of doubt into the ROY race which Calipari-coached phenom Tyreke Evans seemed to have locked up by the first two months of the season. But it wasn't to be, and Curry's drafting by Golden State was a lose-lose for the Knicks and Curry. The Knicks miss out on a local stud who could have gelled well with James and served to entice him to the Garden 41 nights a year barring injury or playoffs and Curry is stuck in a team with no chance of being a legitimate contender any time soon until his rookie contract runs out, because let's face it, now the Warriors know what he can do, no way are they giving him up. What happened to the role player? Seriously though. These days, every team with a decent draft pick is looking for a superstar, whether they already have one or not. It just doesn't work in the league today. An unfortunate legacy of Jordan is that every player dreams of not just winning, but winning it by themselves. But you can't have a whole team with that attitude (just ask Doc Rivers), and the NBA operates under a superstar & company system these days. The go-to guy is carrying more and more of the burden, but then complains about having no superstar help. But here's the thing, that isn't what LeBron needs, that isn't what Wade needs and it wasn't what Kobe needed. You need good role players. Let's use Jordan as an example. Jordan played with Pippen, who is a Hall of Famer and one of the best small forward of all-time, but his lack of an ambition was his greatest asset. The reason the Pippen/Jordan tag-team worked was because Pippen was happy to take what Jordan gave him (especially after Mike up and left on him to play baseball for a little while). Pippen was happy to let Mike be "the guy" and just do his part. The same goes with the rest of the championship Bulls teams. The Chicago front office did a great job of filling the roster with players who were happy to let Jordan be the star if it meant winning. Bill Cartwright, Horace Grant, Paxson were the perfect fit in the original 3-peat. Second time around they found more role players in Kukoc, Kerr and Rodman. It was said that Jordan made the players around him better, and they did. But it was only because they weren't so ambitious as to step outside their roles. Each and every player on those championship teams knew their roles and knew how to get the best out of what Jordan gave them. It was also because Jordan knew how to keep himself in check and let the others do it for themselves. I said earlier that LeBron didn't need superstar help. LeBron is talented enough and versatile enough to carry a team on his shoulders given the right sole players. James doesn't need the one-two punch, he needs a supporting cast. Honestly, he already has the right role players around him, it's just that Mike Brown is incompetent and didn't get his rotations right. JJ Hickson is the perfect supporting cast member for LeBron, when he was getting more minutes he did a great job being another threat on the pick and roll and moving off the ball. So too with Anderson Varejao and Anthony Parker. Bringing in Jamison seemed like a good idea at the time, but it disrupted the chemistry and forced LeBron out of his rhythm. I think Jamison would be best served coming off the bench to get some scoring happening while Lebron takes a breather at this stage in his career when Lebron is capable of playing 40+ mpg for a season. James is at his best when it's all on him and the other players are dependent on his creativity to get involved in the game. Mo Williams is an All-Star because he played in LeBron's wake. Unfortunately, the Cavaliers packed too much talent into one team and it wasn't possible to fit into one team. I'll say this right out, a role player isn't so labelled because of talent. It comes down to what the team needs. Right now, Ray Allen and Kevin Garnett are both role players for Pierce and Rondo, taking what the defense gives them. Now I say this because what I'm about to say might upset some people. Pau Gasol is a role player, and a damn good one at that. There is no way another superstar could shine on a team with Kobe Bryant, but like Pippen, Gasol is happy to take what Bryant gives him and embrace the role of second option. To my mind the difference between a role player and the superstar is ball dominance. If you need a ball in your hands, you don't have a place in the supporting cast. Gasol does his best work on the low post and getting boards. He tried to carry a franchise, and it didn't work. Superstar is probably the wrong word to describe a non-role player, because you can be a superstar role player like Gasol. Phil Jackson is the common denominator in creating a great system of superstar and role players winning a championship. Despite this need to create superstars, role players are still getting the occasional high draft pick. Recent examples that come to mind are James Harden and Hasheem Thabeet. Harden was drafted before reigning ROY Tyreke Evans, but I still think it was the right move. The Thunder have a promising point guard who plays a vital role in drawing attention away from Durant in Westbrook, and KD is a legit superstar. Harden brings a guy who can create his own shot, but also works hard without the ball in his hand. Given a chance to grab Tyreke for the Thunder now, I still wouldn't take him. The same can be said for Thabeet. Despite having a huge upside (read as: raw as French meat), he will never be a superstar. In a team with OJ Mayo and Rudy Gay, two young players who are capable of huge games, they didn't need someone else fighting for the ball and minutes. While it is too soon to say for sure, drafting lottery role players could be the reason why the Thunder made it to the playoffs, and the Grizzlies weren't too far behind. I guess what I'm saying is that this drafting philosophy of "take the best player" regardless of position is a bit daft. Teams need to look long-term and draft to put the pieces together, regardless of how high the pick is. This is a legacy of Jordan, where the drafting of Sam Bowie over Jordan because Portland had Clyde Drexler has become a cautionary tale. But I back that decision, it was the right move for the team, and hey, they got to the Finals with Drexler didn't they? Talent shouldn't be the be all and end all of value for the team, recent role players who were drafted and contributed straight away like Taj Gibson, Wesley Matthews and Serge Ibaka will lead to a greater level of success than creating a logjam of players wanting to be the top dog. I'll touch back on this idea of superstar role players when I get into free agency talk, but that'll do me for now. The Beasley problem and how to fix it. If there is one person who has been shafted by the NBA draft system it was Michael Beasley. When Wade went down with a knee injury and Miami stumbled to a 15-67 record in the 07-08 and was given the number 2 draft pick overall it could have been the perfect situation. Think Tim Duncan and David Robinson perfect. But looking back now, it was the worst thing for both Miami and Beasley himself. The main difference between Duncan and Beasley is that Duncan was a four-year college veteran who came into the league a highly polished rookie with solid fundamentals. Beasley however was a "one-and-done kid"; a stud in college who had never played second fiddle in his life. Beasley needed the chance to strut his stuff most lottery picks are given; first overall pick in the same draft Derrick Rose was handed the keys to the team in his rookie season and now in his second season he is an All-Star. However, when Wade returned he was out to prove he could still be the same player he was, and has admitted recently that he was gunning for the scoring title. With Wade being such a ball-dominant player it left Beasley in an uncomfortable position as supporting cast member and his kindest critics now refer to him as disappointing. But take a look at the numbers; he is averaging 14.3 ppg and 5.9 rpg over two years. As far as supporting cast members go those are pretty decent numbers. But I think everyone knows how special this kid is, and how much better he can play. But there is no need for Beasley to be a superstar in Miami, and playing with Dwyane Wade is not the way to develop as a player. Wade is a remarkable basketball player and he won Finals MVP in 2006 when he led Miami to its only championship. The difference between then and now is that in '06 he was leading a veteran team, where most players had developed their own skills already and were ready to contribute when needed. It was the perfect situation for Wade. The situation now is toxic for Beasley. Put simply, either he or Wade needs to leave. While Wade is a free agent this summer I have a strong belief he will stick around in Miami rather than heading to Chicago (with Beasley's draftmate Rose) or anywhere else and will probably attract Chris Bosh there too. Which means Beasley has to go. The shakeups in the League caused by the impending free agency extravaganza will leave plenty of teams who cleared cap space to make a bid for Bron or Wade or Bosh with lots of money and nothing to spend it on. And given how many teams shed their players to make a bid at free agents some will be disappointed and will need to gain something to please their fans. Enter Michael Beasley. Just so you know how good this kid can be, I'll tell you of my most memorable Beasley moment. It was a game against Denver early in the 09/10 season and Wade was taking a rare breather. At this point Melo was playing out of his mind, and was much improved on both ends of the floor. But on three straight runs down the court Beasley was isolated against Melo and scored with a step back jumpshot (twice) and a blow by to the hole. It seemed effortless. So we have this player who could be a worthy rival for the latest budding superstar in Kevin Durant given their similarity in build and height who hasn't been given a chance to strut his stuff. Below is a list of places I think he should/could go in no particular order. Cleveland Cavaliers: Let's face it, if anyone saw LeBron leave the court after that last loss to the Celtics you saw how he couldn't get that Cleveland jersey off quick enough. He's outta there, whether it be to Chicago, the Nets or Knicks. Which will leave a team used to a ball-dominant small forward and a still respectable supporting cast scrambling for hope. Beasley could be their saviour. Miami needs a reliable scorer and Antawn Jamison could be that guy. Trading Beasley for Jamison would be a win-win. Miami get a veteran running mate for Wade and Cleveland have something to look forward to with a promising young core in JJ Hickson and Michael Beasley. Washington Wizards: The Wizards need to shed Gilbert Arenas. Wall is the face of their future, and having a discontented and unpredictable Arenas lurking around could only be bad for both Arenas and Wall. Miami has been looking for a better point guard for years, and before the suspension this season Arenas was putting up All-Star numbers. If the Heat fail to sign two max-contract free agents they will have more than enough cap space to take on Arenas' giant salary. The Wizards not only get rid of Arenas but they gain a young stud who could work well with a team-oriented future superstar in Wall, who has a rare gift in judging when to score and when not to score. New Orleans Hornets: The Hornets are close to making the playoffs and being relevant again. If Chris Paul comes back healthy they will have the best point guard in the game (sorry Deron Williams) and another who has gotten a taste of running a team and may struggle to adjust to being a benchwarmer again. David West is still reliable and Marcus Thornton will only benefit from the increased attention and playmaking that Paul brings to the table. The ideal situation would be to trade for Beasley. The main attraction for Miami would be Collison, but if the Heat are gearing up for another instant championship, bringing back Posey for another run at it could be just as appealling. Charlotte Bobcats: I admit, when Michael Jordan bought the team I got Bobcat fever, but if their sweep at the hands of Orlando showed me anything it is that they can't win a title with the current roster. Jordan has done a great job of assembling a playoff team with a great coach in Larry Brown (who might be sticking around after Collins got the job in Philadelphia), but they are mainly veterans and castoffs with not a lot of room for growth. As it stands the roster is not going to win a championship, not with an ageing GW and Stephen Jackson. However, they do have some good young talent in Augustin, Henderson, Ty Thomas and Chandler. Add an offensive weapon like Beasley to that lineup and you have a great young core of players who can take over when Jackson in particular calls it quits. Who to give Miami is beyond me, because Jordan might just like this team he has assembled at the moment. But if anyone could make it happen, it would be Jordan. Obviously, there are a number of other options available to Beasley, and Miami might just keep him in case Wade leaves (which isn't impossible, just unlikely). However, these four teams will be the best for all concerned in my opinion. Whatever happens, I hope this talented young player is given a chance to shine and tap that potential for superstardom he has within him. Oh, and for God's sake, put him in small forward, a la Kevin Durant. First of all, welcome. Due to the sorry state of hoops in Australia (more on that below), I am constantly struggling for someone to argue the answers for the classic basketball questions with (LeBron vs Kobe, CP3 vs Deron Williams etc.). So here it is, an outlet for all my pent up basketball jibber jabber most of my friends are sick of hearing. If people get something out of it along the way, better still. 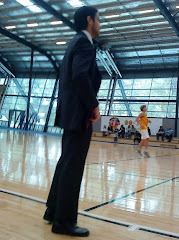 In this, my first post I'll start by discussing something that has always irked me about the NBL. It's boring. The game has devolved into zone defences and excessive outside shooting. There are no highlight plays, no basketball heroes and for me, that means no interest. With the NBL allowing defensive players to sit in the paint for as long as they wish, dunks are a rarity and even then only from centres. PPG averages for individual players and teams are like are considerably less than in the NBA. Interest in Australian basketball is so low that many teams simply ceased to exist last year. But fear not, the solution is right there in front of us. The NBA system. Of all the pro leagues in the world there is one which stands head-and-shoulders above the rest. The original, and the best. An argument can be made for not trying to copycat the iconic NBA, but why not? To my mind, the best basketball is played in the NBA. Sure, you won't have the same level of players but the system is proven to be entertaining and exciting. Each year, the NBA draft attracts massive interest, over here it is just a footnote in the national sport consciousness. It might seem an obvious solution, but there are benefits beyond changing the style over here to a more entertaining package. If the NBL is properly suppported, there is no reason why top-notch high-school graduates who want to play forego college wouldn't come here for a year before entering the League. This idea might seem a bit far-fetched, but look at Brandon Jennings. He proved once and for all that college is not the only way into the league. If the NBL were to adopt the NBA ruleset, it would have an instant advantage over the Euroleague as a pre-NBA destination for young phenoms. A year spent playing the NBA system in Australia getting used to the rigours of life as a professional athlete, learning the pick and roll and even the triangle offense could be vastly increase a player's draft stocks. We have great weather, hot chicks and with an NBA ruleset, are an ideal destination for both young phenoms who don't to be distracted by academia and veteran players looking to make a bit more cash after they are made redundant by ever-more-talented youngsters in the L (which is an alarming trend as it is, but that is for another post). So this is so long from my first entry in this hopefully enjoyable and fresh blog.